The town of Boone, N.C., and Watauga County are hosting their annual rain barrel sale. Customers must order their barrels online by April 24, 2015. Because of bulk purchasing and delivery, the town and county are able to offer the barrels at a discounted rate of $75. The pickup day will be May 1, 2015. The high country has had good precipitation amounts this past year, but many still take water for granted. As happened a few years ago, supplies can be altered at the “drop of a hat” during drought conditions. According to Wendy Patoprsty, extension agent for Watauga County, “Rainwater in the high country represents a high-quality source of water available to us; there is no reason we should let it flow away without using it.” It can take a long time for natural groundwater to recharge. Depending on the landscape, it can take anywhere from one year to 1,000 years to infiltrate into aquifers. According to the U.S. Environmental Protection Agency, 40% of household water usage in summer is from lawn and garden watering. 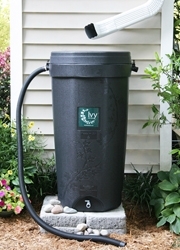 Homeowners can save 1,300 gal of tap water every summer by purchasing a rain barrel.